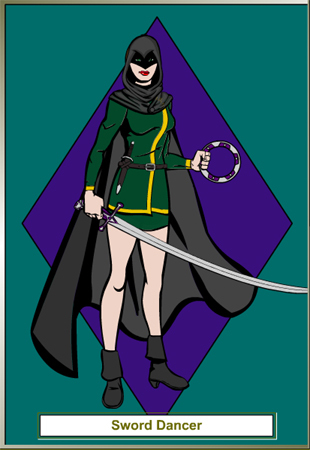 The Sword Dancer is the pinnacle of the elves love of dancing and sword craft. A commitment to dance and sword must be made before a elf can even begin to learn the steps of this deadly dance. Sword Dancers are the elite of elven military, resembling Monks in many ways. A young Sword Dancer must join the order and commit themselves mind and body to the dance, spending decades learning the complex steps and katas. They are disciplined to a code of conduct and a level of fitness far greater than most fighters or even paladins are held to. Where as monks also work heavily on mental strength as well, a Sword Dancer learns to harmonize their movements perfectly between mind and body. Their focus on more martial aspects of combat blend their fast movements with dazzling sword displays. A Sword Dancer is often seen moving before they are even consciously aware of the danger they or their charges are in. The dance is as beautiful as it is deadly and many a elven leader has the Sword Dancers perform at festivals and official events. Sword Dancers are forbidden to ever teach their craft outside the monastery and if they do the teacher and student will be seized and taken to the monastery, where the one who taught it will be sent to the Council of Swords for Judgment and Penance (often ending in them serving the monastery as servants and forever forbidden to Sword Dance again.) The Students they taught their craft to are never seen again, no one knows for sure the fate of them. These measures may seem extreme and even cruel, but the Sword Dance is the one secret elves will never allow to fall into other races hands for fear of it's use against them. Sword Dancers go masked when guarding the homes of the elven nobility. This means the nobles can not identify a particular dancer so no noble will be able to gain leverage over one. This may leave the nobles feeling a little insecure as they can't identify them, but the Sword Dancers themselves have ways of identifying their own so imitating one is extremely difficult. The Monasteries are set up with a ruling council called "Council of Dance" and a council who takes care of judgments, justice, and the defense of monastery called "Council of Swords". A rarer and more specialized group over sees the training of those elves who wish to follow the path of Dance and Spell, this council called the "Council of Song" over sees the training of those few Sword Dancers able to master the skills of the sword dance and magic, becoming BladeSingers (ref: Tome & Blood). Those Sword Dancers who leave the order can no longer advance in the Sword Dancer class, but otherwise do not loose any abilities. Those that leave are still forbidden to teach the art to anyone upon the same penalties as if they where still a part of the order. Requirements: must be elven, any lawful alignment. Special: they gain wisdom bonus to AC if wearing NO armor & must live by a Code of Honor. Weapon and Armor: they are proficient with all Simple Weapons & Exotic Elven Sword (katana), Exotic Elven Blade (wakizashi) & Exotic Ranged Chakram. Not proficient in any armors. Multi-Classing: They may Multi-class as normal, but like monks may never raise their Sword Dancer class again if they do multi class or level up another class (If multi-classed already). Sword Dance: A Sword Dancer may attune him/herself to to a specific sword (magical or not), a process that takes one tenday. During which he/she must wearing the sword or holding the sword for at least 8 hours each day, and if interrupted she must start again. She may only be attuned in this fashion to one sword at a time. Beginning the process of attuning another sword cancels the ability of the currently attuned sword. Once attuned to this sword grants a +2 morale bonus to attack, damage and initiative rolls with that sword and some damage reduction at higher levels. This ability is a mind effecting effect so if your immune to mind effects you can not benefit from this. Dance of Spring: The Dance has to perform this each morning just like the others. But to actually heal you it must be performed at the time of healing. You can heal your levelx2 in hit points, this may be split into small healings. Dance of Summer: The Sword dancer may imbue some magical effects to her attuned sword for the day (it must be the sword used in the "Sword Dance", and still works if the sword is already magical. Choose from two of the following list: Defending, Flaming, Frost, Shock, Ghost Touch. Or one from the following list: Flaming Burst, Icy Burst, Disruption, Bane (choose monster type), Shocking burst, Thundering, Wounding. Perfect Sword Dance: When the dance is performed each day, the Sword Dancer has perfected their dance so well that they actually touch the home of the Elven gods, and upon completion of the dance they take a piece of this with them for the day. They become labeled a "Outsider" instead of "Humanoid" and are treated as "Native Outsiders" for the purposes of spells that will or will not affect them. The power of that divine plane also empowers them, granting them damage reduction of 5/-, but also this does not stack with any other damage reduction. 2001-2005. Sean Nichols. All Rights Reserved. None of these materials may be reproduced in any fashion without express written consent.